"Put this on your fridge. CAMP 2015 was a big success and transcended all of our expectations and dreams. 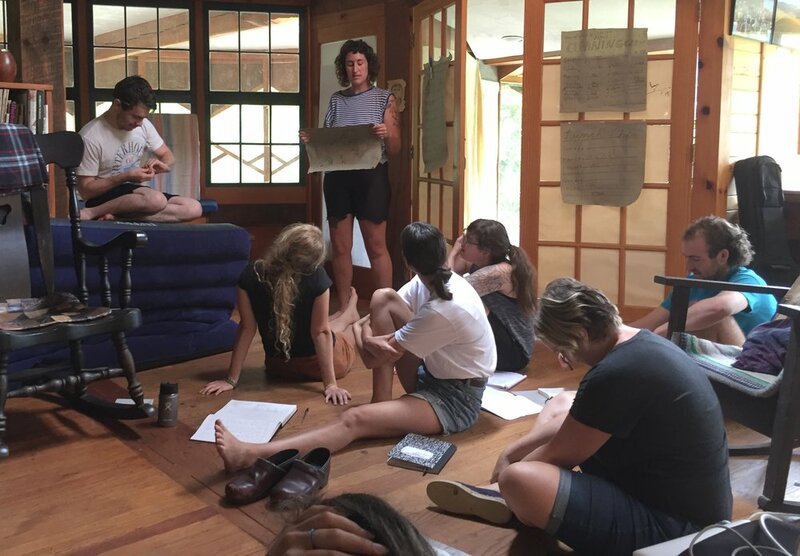 21 daring artists came together, from near and far, at our temporary home at a big barn in Hardwick, VT for our inaugural season. Together we created a community which has continued to grow after and beyond CAMP. For our second summer, in August 2016, a group of artists will meet in a new undetermined location (somewhere in the continental US.) Based on the concept that each CAMP participant carries a unique set of skills and knowledge everyone will come prepared with one class, project or workshop to conduct with the rest of the group. Days will consist of these "classes" in the morning, independent worktime in the afternoon and sharing in the evening. This is your official invitation to CAMP, August 6-14 2016. If you recived this postcard, with think that you are a great candidate. Please save the date and spread the word!